Its Sunday morning and myself and Lucy have been planning a lovely walk along Hove beachfront to Southwick to try The Schooner that we have heard such wonderful things about. Unfortunately, we open the curtains to discover that it is raining. Fortunately, Lucy’s car is parked nearby so we drive along the Kingsway instead. We park the car out front and quickly jump inside to avoid the rain. 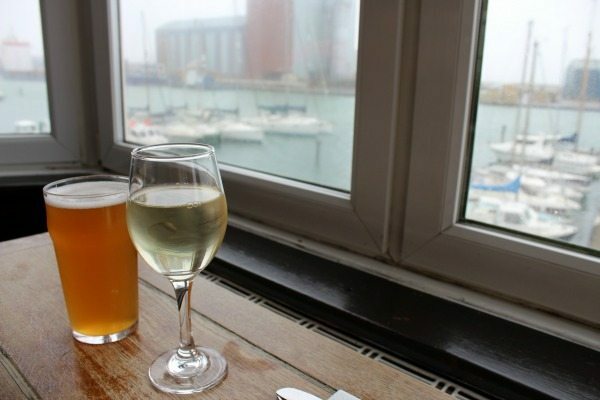 The Schooner is an inviting gastro pub with a large open layout with light beaming in through the large bay windows, looking out to the Lady Bee Marina. We are warmly welcomed by the staff and shown to our seat right in the bay window; I would advise to pre-book or show up early to benefit from this prime seating. We look through the drinks menu and upon asking I find out The Schooner have commissioned their own Pale Ale from a local brewery the Naked Beer Co. 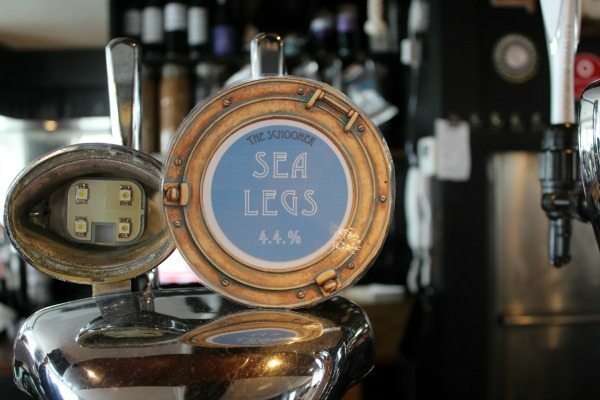 They have named this treat Sea Legs and it is slightly cloudy and full of flavour. At just £4.00 a pint it is a steal and would rival any premium on offer, having said this they have a wonderful selection of beers to match any palate and they pride themselves on using local Sussex brews that we should all be proud of. As Lucy is driving she just wants a small glass of white wine, normally she would go for the Sauvignon Blanc but on advice of the staff Lucy opts for the Pinot Grigio instead. What a wonderful suggestion as the wine is fruity and refreshing and suitable for those with a dry palate. Now we are settled with drinks it is the hard decision of what to order off this wonderful menu. We are of course here for the fantastic roasts that we have heard so much about but we have to begin with the starters first. 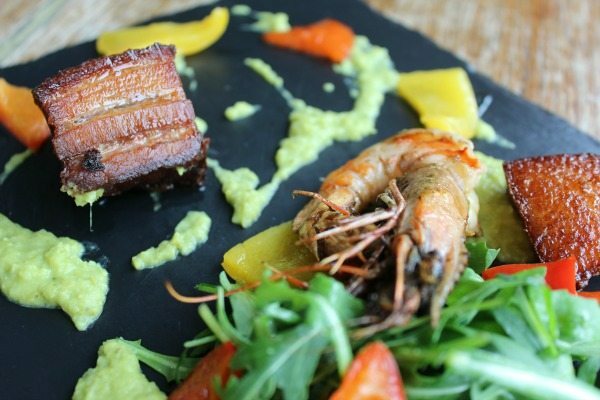 For me it is a no-brainer, there is the option of a pork belly and tiger prawn dish served with a pea puree and confit peppers. For Lucy, choosing between the beer battered tofu and the chicken liver pate is a hard decision, but she decides on the chicken liver pate as long as we share. 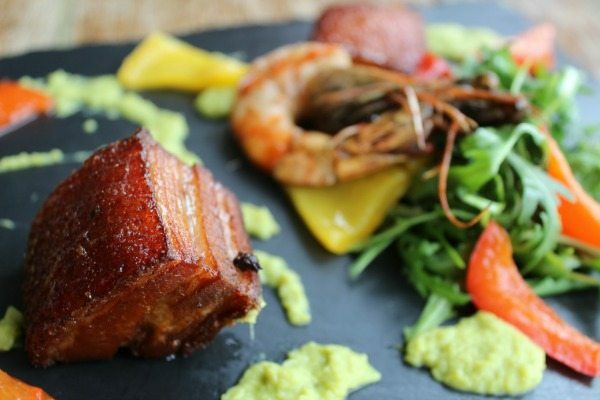 We are blown away by the presentation; served on a black slate, the pork belly is golden against the dark back drop, the pea puree vibrant and fresh and the tiger prawn proudly sits in the middle. Everything is so fresh; you can taste the sea in the prawn and the pork belly just melts in your mouth. The attention to detail is amazing and after asking the staff and finding out everything is locally sourced just make, not only this dish but, everything about the Schooner a winner! 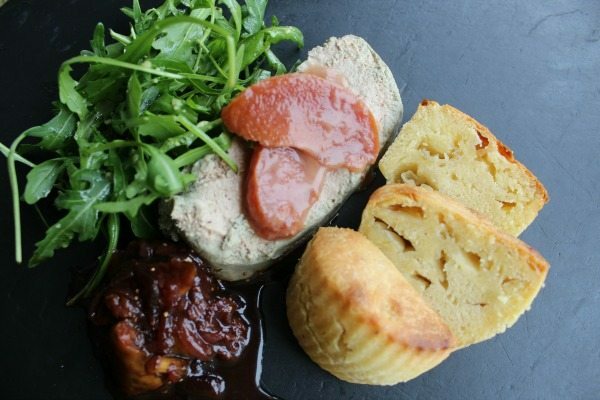 The chicken liver pate is served with a delightful plum and fig chutney and a warm brioche. Normally I am not the biggest fan of pate but The Schooner has made a convert of me. 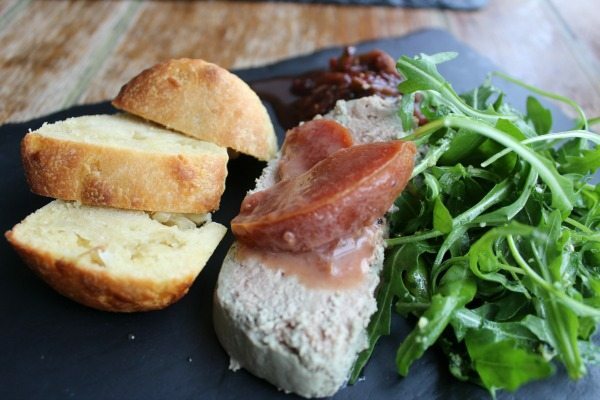 The pate is smooth and the chutney compliments the richness so well. The warm brioche is superb; with everything cooked in house, my hat goes off to the chef and we havent even had our mains yet. As we have shared the starters, Lucy has twisted my arm to do the same with main courses. I ask for recommendations and hearing that the lamb is, again, locally sourced and that they use all parts I am very tempted. However I have heard that one of best roasts around is the sirloin of beef at The Schooner; combining the use of a sous vide and roasting, this beef sounds amazing. 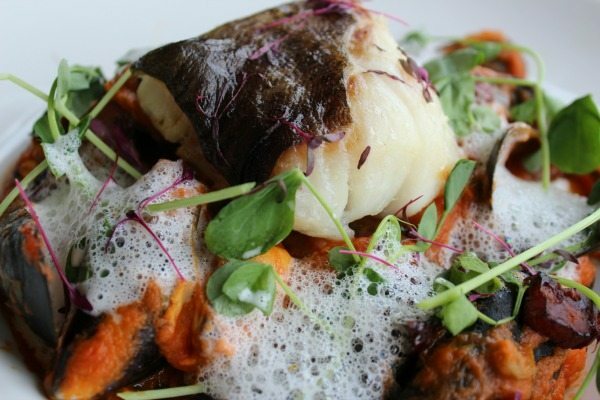 For the other dish we want to try something a little different and though they have a great sounding gammon roast on today we choose the pan roasted Portuguese salted cod. The food is brought over to the table quickly and the pub is filling up now so we are very impressed as a pub this popular and I would have expected more of a wait. They certainly know what they are doing and the communication between the staff is fantastic as I listen to them update each other on the availability of each dish. 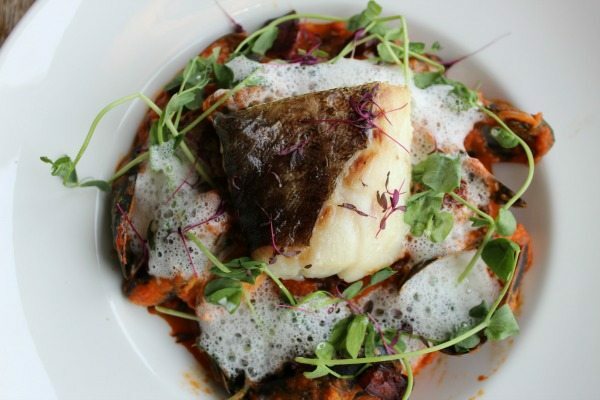 The salt roasted cod sits atop a bed of new potatoes and is surrounded by mussels and chunks of chorizo. The tomato, olive and caper sauce adds a vibrancy to the dish which is delicately finished with fresh shoots and a white foam; visually the dish is amazing. Eager to dig straight in we both grab a fork, the mussels are my first choice and I love that they are still in the shell as this just adds to the presentation. They are perfectly cooked and the sauce is wonderful, rich and full of flavour. A fork full of the potato and chorizo covered in the sauce is a real treat before delving in to the centre piece. The cod breaks apart and is cooked just right, the saltiness matched with the tomato sauce is just plain fantastic cooking. Every mouthful is an explosion of flavours, a saltiness, sweetness and richness that will have you wanting to lick your plate. Seriously, this is one of the best fish dishes I have had in some time. 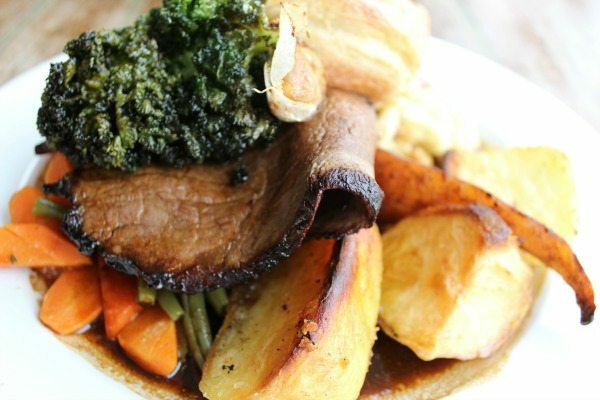 The sirloin of beef drapes over a wonderful selection of vegetables, from a spring onion mash that is light to fluffy to roast potatoes with a crispy coating. Carrots, beans and crispy kale poke out of the sides, with the additions of a well risen beef dripping Yorkshire pudding and the cauliflower cheese you will be very satisfied. The beef melts in your mouth and add a little bit of everything to your fork, you will be in roast heaven. I quickly realise why people travel out from Brighton every week to experience the menu at The Schooner. Though we are both full and extremely satisfied, there is a sticky toffee pudding on the menu and I know Lucy will not be able to resist. We decide to share a pudding and request two spoons. As the pudding is served I kind of regret not ordering two, having to share the dessert, the pudding looks great with the butterscotch sauce adding a shine to the top and pouring down the sides. 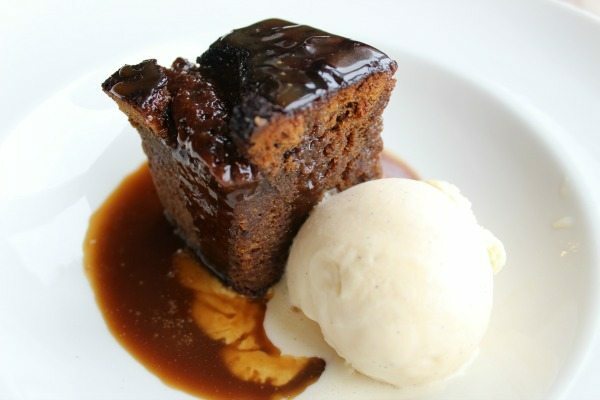 The pudding is rich as you would expect, but not too heavy, with the vanilla ice cream mixing with the butterscotch turning this into a superb dessert and the perfect way to finish a wonderful meal. The Schooner have surpassed the reputation they have so deservedly gained; not only was the food to the highest standard, they do this through locally sourced produce including the fantastic array of beers. The staff are friendly, knowledgeable and worked together to deliver a first class service and just one of so many reasons to visit here quickly. 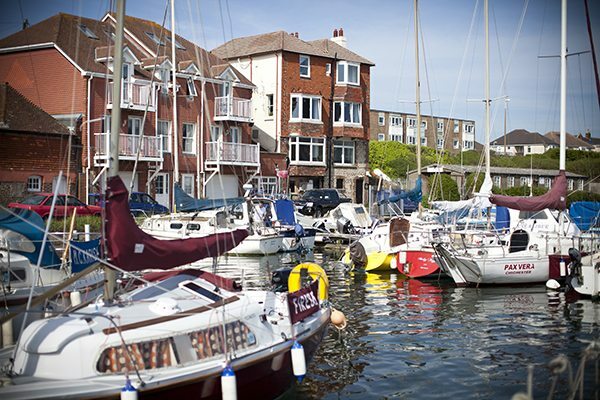 Whether you want a nice walk along the seafront or a quick jump in the car, the Schooner is a great reason to get out on a Sunday, in fact any day of the week. 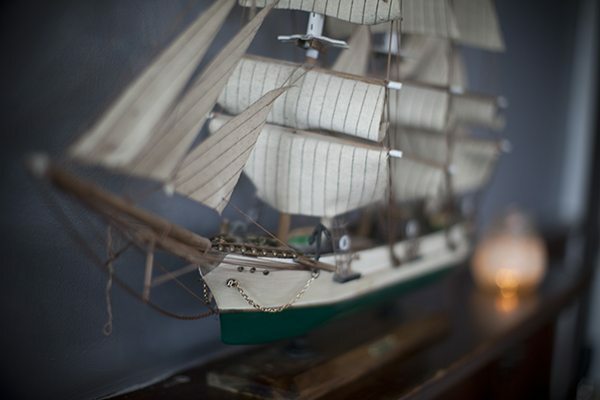 Top quality cooking in a wonderful setting, feeling at home from the moment you arrive and at such great value. Why have you not been already?